The 2018 report on Romania was written by Laura Ștefan, anticorruption expert, former director in the Romanian Ministry of Justice, and international expert on rule of law; and Sorin Ioniță, expert in public administration reform and development and an associate lecturer at Maastricht School of Management (MSM) and Babeş-Bolyai University (Cluj); and Septimius Pârvu, expert in good governance and electoral process. The year 2017 was a turbulent one in Romania. Following the relatively calm tenure of a caretaker cabinet, 2017 saw massive street protests against government attempts to limit judicial independence and undermine the country’s anticorruption framework. A new cabinet led by the Social Democratic Party (PSD) fueled significant public distrust by attempting to pass emergency ordinances in these sensitive areas immediately after taking office in January 2017. The protests halted some of the proposals in early 2017, but debates around the limits of political, administrative, and criminal liability continued throughout the year, engaging the of whole society. While the Constitutional Court made several attempts at drawing clearer boundaries and sanctioning all excesses, by the end of the year it remained unclear how these decisions will be implemented in practice, both by the legislature and by the judicial authorities. The problem is that while in some cases bad managerial decisions are coupled with criminal conduct, in many other cases they are not. Still, in the public administration there was serious concern about what may or may not be seen as illegal conduct. This uncertainty paralyzed decision-making processes at various levels. The civic sector’s reaction to what were deemed bad political decisions was rapid and significant. New groups sprung up around an anticorruption platform in various Romanian cities. Informal gatherings and grassroots movements have grown in profile. The protest mood continued throughout the year, with people in the streets contesting not just proposed changes to the judiciary, but also government decisions on fiscal policies or pensions. This signaled a potential start of political accountability in a country that so far has relied almost exclusively on criminalization to sanction bad political behavior and decisions. There was broad support in the parliament for the anti-liberal amendments to the Constitution promoted by the Coalition for Family (a grassroots conservative movement), while the alleged “plot by Soros against Romania” was periodically brought up by party leaders to justify proposed bureaucratic restrictions on civil society.2 Mainstream media, including public television actively promoted public figures who spread a nationalist discourse. Although not necessarily coordinated, these are signs of a potential rapid degradation in the democratic governance and fertile ground for dangerous populism and hate speech in the future. The ruling coalition formed by the PSD and the Alliance of Liberal Democrats (ALDE) was unstable throughout the year, with factions competing for power in the vacuum created by a crisis of leadership. Due to the rejection of a record number of flagship policies or a substantial amendment by the coalition’s own MPs, the government was also regarded as incompetent. In June, the cabinet was toppled by the very coalition that put it in place, due to nothing other than infighting within the Social Democratic Party. The government also hastily prepared legislation in an attempt to patch up the widening budget deficit, which peaked at 4.1 percent of the GDP, the largest in the EU in the second quarter of 2017,3 and closely missed the 3 percent EU stability ceiling at the end of the year. Romania’s economic growth is based on consumption, fueled by a boost in social spending,4 while investments have been cut. The absorption rate of EU funds remained at record lows halfway into the second programming cycle of EU membership.5 Growing macroeconomic imbalances will probably trigger a deficit procedure from the European Commission and Romania may at some point need IMF support. At the local level there has been a worrisome trend towards consolidating clientelism and opaque governance. The national government has used discretionary funds to foster networks of influence and control at local level, while municipalities have set up public companies to outsource lucrative public functions and bypass the checks and controls applicable to public institutions. In 2017, the parliament postponed draft legislation aiming at reforming the judicial framework. Both the Superior Council of Magistrates and professional organizations strongly protested some of the proposed amendments. A general mistrust in the ruling coalition lingered throughout 2017 as events from the beginning of the year remained fresh in the memory of both magistrates and the public. Several scandals erupted around the National Anticorruption Directorate (DNA), and several prosecutors left the unit or were laid off. The chief prosecutor was suspected of friendly relations with various politicians currently under investigation. Though investigations into these allegations were still ongoing at year’s end, the scandals have weakened the profile of an institution seen by many as a key player in disciplining public life. Outlook for 2018: Attempts to weaken judicial independence and the anticorruption framework are expected to continue in 2018, accompanied by an increasing illiberal discourse against groups that oppose those changes. In preparation for the presidential elections scheduled for 2019, the government’s populist and clientelistic behavior will also continue, including attempts at buying influence at the local level with public funds. A referendum to change the constitution to redefine “family” could be instrumental in energizing socially conservative groups. The year 2018 also marks 100 years of Romania’s existence as a unified state. Major celebrations are planned inside and outside the country. This will increase the nationalist sentiment building upon the existent political narrative. 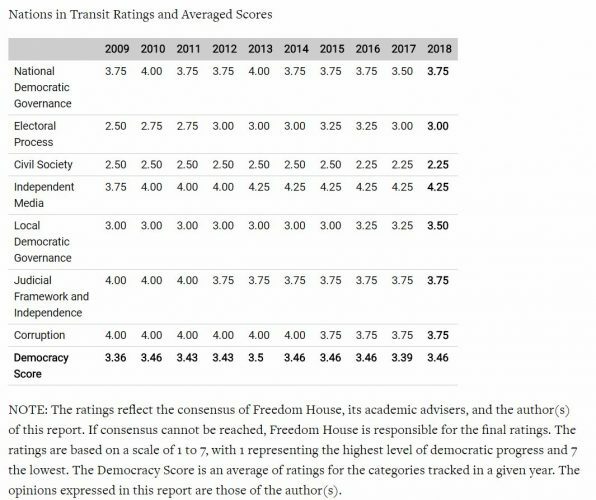 The full report can be consulted on Freedom House’s webpage. Posted in News and tagged administration, bad governance, clientelism, corruption, democracy, dragnea, elections, electoral, freedom house, good governance, governance, juridiary, mass media, media, nations in transit, politics, psd, reform, Romania, rule of law.